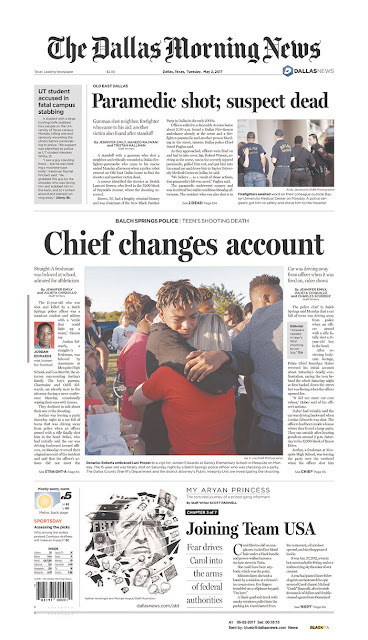 Once the bodycam footage of the Balch Springs police officer who shot and killed the 15 year old comes out, we are going to have a huge national story on our hands. It has all the elements: (1) minority victim, (2) teenage victim, (3) shot in the head (4) unarmed, (5) cop initially lies about what happened, (6) unjustifiable shooting in that the car was going away from the officer, and (7) the cop decided to use a rifle. I called it Groundhog Day last week but we truly do live in a Groundhog Week: Cop shooting, motorcycle death (this one at 287 and the road to Newark in a bizarre wreck), and the Rangers can't hit. A woman was gunned down in her car in the Ridgmar Mall parking lot yesterday afternoon but other than it being "domestic related", we know hardly nothing. Someone commented yesterday the Baylor football will be "as bad as they've ever been" this fall. Buddy, you have no idea how bad Baylor used to be. Autistic Bridgeport boy "connects with law enforcement worldwide." I'm reading so much about how the Netflix series 13 Reasons Why might be dangerous for teenagers to watch and many are apparently doing so. Denton and Krum schools sent letters home about it. Alabama softball player homers against Ole Miss. Misses home plate during the celebration. Gets tagged out after a slight delay.